A semi truck rolled over and crashed Wednesday morning on Interstate 5 in Tumwater, according to the Washington State Patrol. The incident occurred around 8:30 a.m. near 93rd Avenue SW.
A passenger car and a FedEx truck were also involved in the semi-truck crash. There was no immediate report of injuries. A preliminary investigation found that the accident began in the northbound lanes between a passenger car and semi truck. The semi lost control and slammed through the center concrete barrier. The semi hit a FedEx truck traveling in the southbound lanes. 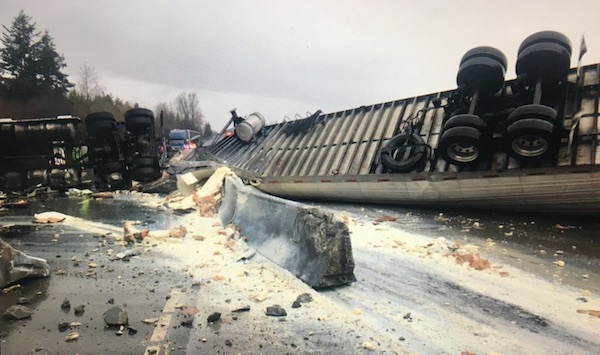 The semi overturned during the crash, spilling its load of powdered milk in large bags. The southbound lanes of I-5 are blocked at the scene until further notice. Attorney Chris Davis and the team at Davis Law Group in Seattle help people injured by bad truck drivers and trucking companies recover the financial compensation they need to deal with their injuries, while holding the trucking company responsible for its failures and misconduct. A majority of truck accidents in Washington state are caused by driver error. Truckers are often motivated or pressured to work long shifts and push the limits of safe driving. This can lead to serious and possibly deadly accidents. 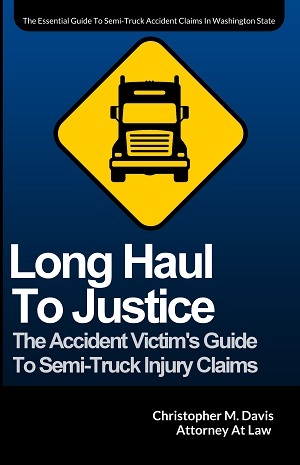 The trucking company itself is often liable for these accidents as well. They are responsible for maintaining a fleet of trucks, making sure the tires, engines and brakes are in working order. The company also does the hiring of drivers, tests the drivers for drugs and alcohol, and monitors the driver’s logbook. Overlooking any of these areas can make the trucking company responsible in the event of an accident. Truck accident cases almost always contain very complex circumstances that require extensive investigation and study by knowledgeable and experienced attorneys. Along with the serious injuries that often accompany a truck accident, it is crucial to find skilled and dedicated representation to help when you or a loved one are injured in a collision with a semi truck. Davis Law Group offers free case evaluations to accident victims in Washington state. We can come to you if needed. Call (206) 727-4000, use the chat feature below or fill out the form on this page to get started.